Creating money flowers can be tricky but definitely worth the reward. Money flowers can be used for conversation pieces, as party tricks or as birthday gifts. 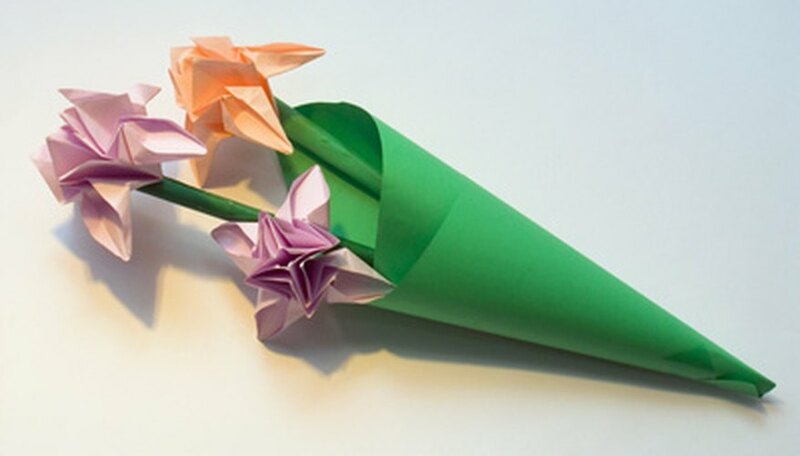 Create several flowers to make a bouquet for a special gift. Once you master this simple technique, you can move on to creating more complex flower designs with money. Place one dollar bill flat on the table. Fold in the wide sides of the bill about one inch. Fold the dollar bill in half lengthwise and unfold to create crease in the center. Fold each corner inward to meet the crease in the center. Your dollar bill should now look somewhat like a diamond. Fold the dollar bill in half lengthwise two more times. Repeat steps one and two with the other dollar bills. Lay all three, folded dollar bills on top of one another and wrap the center with craft wire, leaving about 4 inches for the stem of the flower. Hold the center of the dollar bill flower and fan out the petals. The first fold determines the length of the flower petals. The larger the fold, the smaller the petals. Use new dollar bills for the flowers if possible.